Fletch Lives is an OK follow up to Fletch. I didn’t enjoy the first, but I could see how others might like it. It had a certain charm, and Chevy Chase is a likable actor. I’m assuming you’d have to be a big fan of the first to find this one fun, because I just wasn’t that into it. 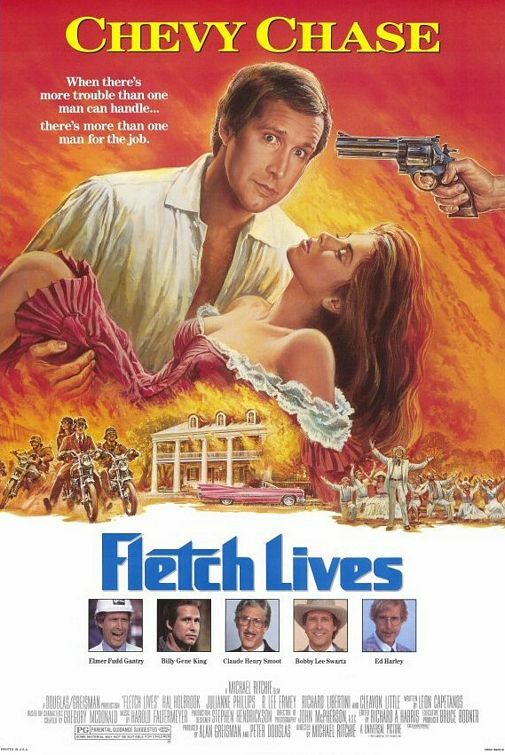 Fletch Lives catches up with the investigative reporter as he learns that he’s inherited a dilapidated Louisiana plantation from a relative he didn’t even know existed (does this ever happen in real life?). Fletch heads south, and quickly begins butting heads with local law enforcement when he hooks up with a woman only to wake up and find her dead the next morning. He also becomes suspicious when he receives real estate offers on his worthless land and starts to investigate why. The mystery element is entertaining, but just as in the first this movie this doesn’t have many highs and lows. It exists in a strange middle ground filled with laughs, but really lacking in any other emotion. Still, I found myself laughing more this time around, despite most of the jokes relying on tired Southern stereotypes. However, when pressed to come up with a favorite scene I find myself unable to really recall any of them, so maybe I was just happy to be finished with these movies? This sequel to the amusing Fletch catches up with Irwin ‘Fletch’ Fletcher (Chevy Chase) as he is awaiting his boss to finally allow him a well-earned vacation, Fletch discovers he has inherited a large mansion in Louisiana from an obscure relative he never even knew existed. He quits his job with the intention of moving down south and living like a king on his new property, only to arrive and discover the house is dilapidated and not worth much at all. While in Louisiana, Fletch gets caught up in the murder of the lawyer who notified Fletch of his inheritance, and also decides to investigate the sudden interest in his clearly worthless land. Using his vast array of disguises to break into secure places he probably shouldn’t be, Fletch must uncover a secret surrounding a cultish church, while also having fun with the assortment of Louisiana hicks he encounters on his travels. I laughed more during this film than I did during the first one. Watching Chase interact with the bumpkin locals is one of the film’s highlights. I liked how the sequel took Fletch out of his comfort zone in Los Angeles and placed him in the deep south. It was a funny way to let Chevy Chase go to another level in his second outing as Fletch. The supporting cast is ok, but nothing special, this is Chevy’s movie, just as the first one was. The only other actor I recognised was Cleavon Little from Blazing Saddles. The rest of the cast is mostly just a collection of character actors to surround Chase while he has a fun time dressing up in disguises. The disguises are definitely a highlight of the film for me. The sequel really raised the bar in terms of make up for Chase, he is able to do so much more with a larger budget. I am interested as to why there was never a follow up to this film. It was quite successful at the box office, and had a really small budget compared to some of the other films going around. I’d like to know why Chevy Chase would not make more of these, yet continued to make National Lampoon’s Vacation films until the late 90s. This follow up to Fletch improves on the original by allowing Chevy Chase to have more fun in the makeup chair and taking him out of his LA comfort zone. The story is solid and, just as the original, keeps the mystery hidden rather well until the big reveal during the climax. I would still rather watch The Three Amigos, but this is a solid alternative.